Save The Date For Biketoberfest 2018! Biketoberfest 2018 Is Right Around The Corner! If your schedule has a couple openings between Oct. 18 and Oct. 21, fill them in with fun-filled events at Biketoberfest 2018! There’s plenty of time to make plans with old and new friends for this annual motorcycle affair. Don’t Miss These Fun 5 Events! Relax and socialize at this annual Biketoberfest hotspot on Thursday, Oct. 18 from 9 a.m. to 5 p.m. at the Daytona Flea and Farmers Market, located at 1475 Tomoka Farms Rd., Daytona Beach, FL 32117. Enjoy a wide variety of food and drink, live music, and receive an autograph from Top Fuels Nationals Dirt Drag champion Paul Plummer during the day. Dyno testing will be available along with ample opportunity to browse the product offerings of many dealers and vendors. Enjoy seat time and help the pets of the Halifax Humane Society at the Halifax Humane Society Biketoberfest Ruff Ride poker run on Thursday, Oct. 18. Check-in begins at noon at 2364 LPGA Blvd., Daytona Beach, FL. Online registration is $25 per person and closes at 5 p.m. on Wednesday, Oct. 17, while in-person registration the day of the run is $30 per person. Riders will wind their way through Daytona and end at Iron Horse Saloon where a dinner reception awaits. One poker hand is included with registration. 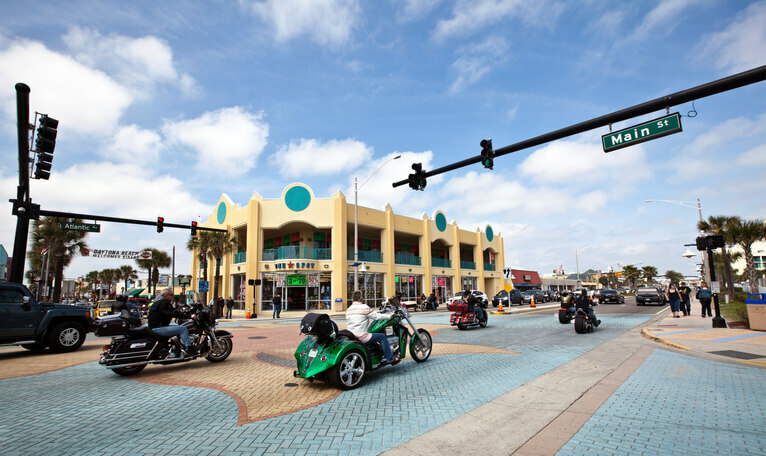 Take in the sight of immaculate bikes — or show your pride and joy off — at the 26th annual Daytona Beach Boardwalk Bike Show on Friday, Oct. 19 from 8 a.m. to 6 p.m. The show will be located at 12 North Ocean Avenue, Daytona Beach, FL 32118. Admission to the show is free, but registration to enter a bike is $25 from 8 a.m. to 2 p.m. with early registration 8–10 a.m. the day of. Winners, announced at 4 p.m., will receive one of 59 trophies in 20 categories, including 4- and 6-foot trophies for Judges Choice. Whoever wins Best-in-Show takes home a $500 prize. Experience the sights and sounds of racing motorcycles from a century ago on Friday, Oct. 19 at the New Smyrna Speedway Sons of Speed Vintage Boardtrack Races. From 3 to 5 p.m. at 3939 State Road 44, New Smyrna Beach, FL 32168, participants and spectators can watch vintage American racing motorcycles from 1910 to 1952 take part in several heats followed by a championship round. Admission is $20 in advance and $25 at the event with gates opening at 2 p.m.
Ride through picturesque Old Florida while supporting The Arc of Volusia during the non-profit organization’s annual charity ride on Saturday, Oct. 20. Registration begins at 7:30 a.m. at 100 Jimmy Huger Circle, Daytona Beach, FL 32117 with kickstands up at 9 a.m. Registration is $25 for single riders and $40 for doubles. The ride winds through The Loop, a route known for its live oak canopies and blend of ocean and marsh views. The Arc of Volusia assists individuals with developmental and intellectual disabilities. Accidents happen: The vast majority of the time, accidents happen when you least expect it. Because that time can be anytime, have an ace in the hole with a free tow card from 911 Biker Law. Unfamiliarity with area repair shops: Biketoberfest brings thousands of riders from all points in Florida and beyond every year. Whether you’re from the area or an out-of-towner, our tow card will help you and your bike to the closest repair shop. This can be a great relief if you don’t know what repair shops are available nearby. We’re motorcyclists, too: Motorcycle attorneys by day, we’re also motorcycle enthusiasts and riders away from the office. Our free tow card aims to give you peace of mind in a stressful situation, one that no rider wants to find themselves in. This card covers the first 10 miles of one tow to the closest repair shop after an accident or mechanical breakdown. To learn more, or to pick yours up, contact 911 Biker Law today!